Scotland has a wealth of extremely beautiful islands, not only with world-class beaches, but with mountainous scenery, rugged interiors and hospitality that is hard to beat. With some of the nation's best whisky coming from these islands too, they are even more of a delight to delve into. Exploring the Scottish Islands on foot is the best way to discover their astounding beauty, spectacular scenery, inspiring geology and turbulent history. 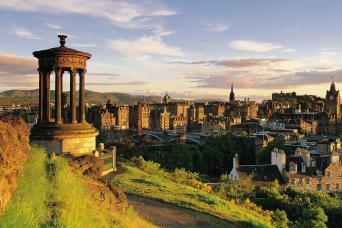 Discover the true magic of Scotland as you walk the isles. 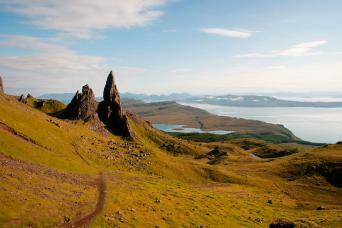 Take a Long walk the Isle of Skye, or walk around the charming Island of Arran. 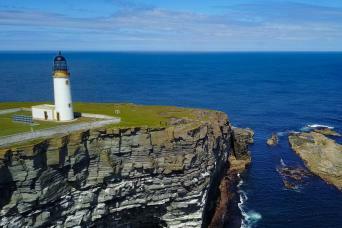 Or you can head further out, to the very fringes of this great nation and visit Orkney and or take a drive and hike trip through the Hebrides. 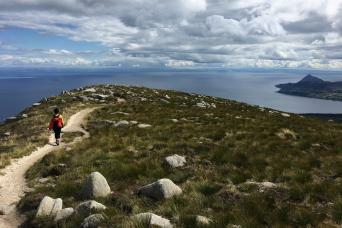 Spectacular scenery, inspiring geology and turbulent history. 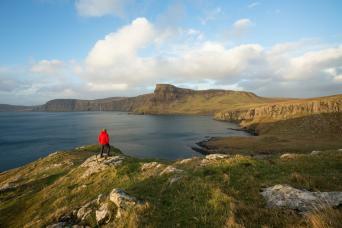 Discover the true magic of the most famous of Scotland’s islands on our shorter Isle of Skye walk along the highlights of the Skye Trail. 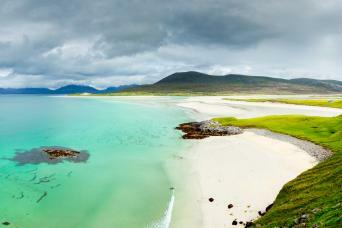 A relaxed drive and hike tour through the spectacular scenery of Barra, South & North Uist, Harris and Lewis. 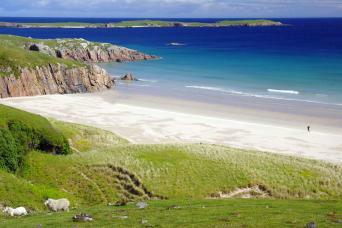 Enjoy varied landscape of Scotland's far-flung Western Isles. Take a road trip to remember on the North Coast 500; miles of breath-taking scenic roads through the northern Scottish Highlands, with a choice of walks, over 12 incredible days. By day discover remote lochs and glens, wild mountains landscapes, then enjoy Highland hospitality each night at your friendly hand-picked B&Bs and guesthouses. Discover the romantic Highlands of Scotland, mystical Isle of Skye and majesty of Edinburgh on this walking and discovery self-drive tour of Scotland. Deep brooding lochs, jagged peaks, imposing castles and fresh caught seafood are just a few of the delights you can look forward to. 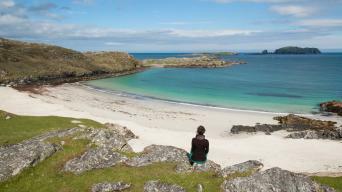 Explore the spectacular Inner Hebridean Isles of Mull and Iona on foot on this drive and hike adventure. This area is home to playful marine mammals and majestic sea eagles, as well as stunning Highland scenery just begging to be explored. 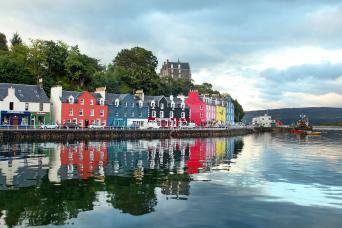 Walk in the footsteps of St Columba on Iona and marvel at the colourful houses of pretty Tobermory on Mull. Hike to ancient Neolithic sites and cross the turbulent waters between islands, home to orcas, seals and ship wrecks. Walk to the spectacular sea stack, the Old Man of Hoy, where the cliffs below throng with seabirds. Trails lined with rare wild flowers lead you through a land of ancient brochs and Viking heritage. A self guided two-week drive and hike adventure through the highlights of Scotland's Highlands and Islands. Explore and experience the best of wild Scotland on scenic drives and hiking trails, including the Trossachs, Ben Nevis, the Isles of Skye, Lewis and Harris, the Cairngorms and Highland Perthshire. Discover the true history and people of Skye on your journey from end to end of this magnificent island. 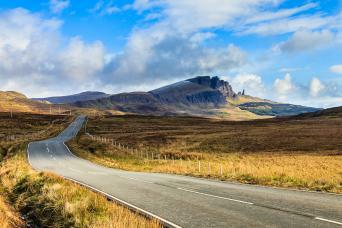 A self-drive tour of Scotland with a great choice of walks and trips between islands by ferry. From Glasgow, drive via Loch Lomond to Mallaig/Oban, then sail to the remote Outer Hebrides; the islands of South & North Uist, Harris, and Lewis. Your road trip ends on the northwest mainland of Scotland at Ullapool, from where you can return by road to Glasgow, Edinburgh, or continue your travels in Scotland. Walk around the Isle of Arran, a charming island nestled in the firth of Clyde and known as 'Scotland in miniature'.